Wind, Wasser, Sonne, Biomasse – welche Energiequelle fasziniert Sie am meisten? Oh, die Sonne natürlich. Afrika ist meine Heimat. Der ganze Kontinent hat ein riesiges Potential für Sonnenenergie. Aber nicht einmal ein Prozent davon wird richtig genutzt. Weltweit haben 1,6 Milliarden Menschen keinen Zugang zu Strom. Die große Mehrheit dieser Menschen lebt in Ländern, wo die Sonne permanent scheint. Es wäre leicht, ihre Lage zu verändern. Es brauchte nur ein paar Solarzellen. * 95 percent in rural sub-Saharan Africa have no access to electricity. * Solar power is a cheap, safe, clean alternative to kerosene lamps. * Rural Energy Foundation supports local entrepreneurs to sell low-cost solar systems. One of the main problems with wind and solar power is covering huge tracts of land with solar panels and windmills - so why not use arid land instead? (...) The New York Times recently revealed that thousands of acres of farmland in the San Joaquin Valley, that are no longer used for agricultural purposes due to salt contamination from years of irrigations, are to be utilized for potential solar power complexes. The plan to use 30,000 acres of previously unusable land is one of many plans being developed by American utility companies to make the countryâ€™s power supplies as diverse and renewable as possible. As such, the construction of the proposed Westlands Solar Park offers greener alternatives to potentially several nuclear power stations and will be able to generate as much energy as the controversial units. Aquila Private Game Reserve outside Cape Town has concluded a deal which will see all its daylight energy requirements covered by solar power. With the installation of a 60 kilowatt facility, the initial step in the development of a 50 MegaWatt plant, the game reserve will be using a Concentrator Photovoltaic (CPV) system, with panels that move to track the sun. A qui donc servent le fait de signer la convention de Kyoto, ou de participer Ã la confÃ©rence de Bonn sur les Ã©nergies renouvelables et particuliÃ¨rement le solaire et celle toute rÃ©cente de Coppenhage ? (â€¦) Les usines, ateliers dâ€™ouvrages mÃ©talliques, menuiseries et autres salons de coiffure, ont ainsi dÃ» tourner au ralenti, voire cessÃ© leurs activitÃ©s en fin dâ€™aprÃ¨s-midi, depuis hier. Les particuliers, quant Ã eux, sâ€™Ã©taient dÃ©jÃ prÃ©parÃ©s Ã lâ€™avance en incluant dans les courses, les paquets de bougies et autres lampes solaires, chargÃ©es durant la journÃ©e et autonomes pendant environ une heure. Outre les bougies et les piles, les lampes solaires et les lampes rechargeables ont Ã©tÃ© particuliÃ¨rement recherchÃ©es cette semaine en prÃ©vision du dÃ©lestage. La vente de ces produits pouvant se substituer aux Ã©clairages Ã©lectriques a ainsi explosÃ© depuis hier. Les magasins spÃ©cialisÃ©s comme les quincailleries ont vu les demandes augmenter. Une vingtaine de lampes Ã nÃ©on rechargeables ont Ã©tÃ© Ã©coulÃ©es par jour, chez un magasin spÃ©cialisÃ© Ã Behoririka. Leur coÃ»t varie de Ar 40 000 Ã Ar 100 000 environ en fonction de la qualitÃ© et de la marque. Dâ€™autres types de lampes fonctionnant Ã piles, moins chÃ¨res puisque vendues entre Ar 5 000 et Ar 10 000, ont Ã©tÃ© plus accessibles aux consommateurs Ã revenus moyens. Les ventes de bougies ont, elles aussi connu une hausse inhabituelle depuis hier soir, chez les Ã©piciers de quartier. Â« Nos clients habituels sont les familles qui habitent des logements sans Ã©lectricitÃ©, mais en ce moment, sâ€™y ajoutent le reste de la population qui se prÃ©pare au dÃ©lestage Â», explique un Ã©picier dâ€™Andravoahangy qui a Ã©coulÃ© jusquâ€™Ã 25 paquets de bougies de 10 unitÃ©s, rien que dans lâ€™aprÃ¨s-midi dâ€™hier. Bref, pour lui, les affaires ont Ã©tÃ© plutÃ´t bonnes ! 15 August 2010 [MediaGlobal]: An estimated 1.5 million deaths in Africa have been caused by the use of kerosene lamps. In an effort to address this issue, the first solar-powered light bulb is now being distributed as an alternative for people in developing countries who live without electricity....â€œSolar powered lights can be considered a substitute for kerosene lamps in many ways, but the key is how one packages innovative financing along with solar lighting that is what will make it affordable for the poor,â€� Hande explained....At present, the cost of these solar bulbs is a main concern for Nokero. A single unit is sold for $15, but when sold in bulk, the price will be significantly lowered, with some as low as $6. â€œThere is a great need for these light bulbs, and many people will be able to use them,â€� Boyd stated. Finding ways to make these solar lights available will reduce the number of kerosene lamps needed, providing safer and healthier living situations for the vast amount of people living without electricity today. Exxaro and partners in its evolving clean energy company, Exxaro Energy, could consider listing the company on the JSE late next year, depending on its financing needs, says business growth GM Ernst Venter. Exxaro has said previously its clean energy company planned to build up to about 3500MW-4000MW of capacity from different sources by 2020. These sources include about 600MW from co- generation, wind and solar projects and 600MW-1200MW from a proposed baseload independent power station at Thabametsi in Limpopo. Mr. David Sunstrum came with his wife to Burundi in 1980 years ago came with the Bahai faith ministries and for the first 13 years built and run three schools, notably, Ecole International... The most unique feature is that the 2.5 ha property have been completely solarised. The whole place functions on 95% solar energy and 5% wind. David has found solar energy to be more cost efficient. The swimming pool, for example operates completely on solar powsolar lamps that light the entire property at night. There is an extensive use of modern four watt LED tubes whose brightness is equivalent to at least 40w. All the equipment is an energy efficient 12watts including the refrigerators. WHEN I recently wrote that we need to invest more aggressively in alternative energy, in light of the oil spill at the Deepwater Horizon rig in the Gulf of Mexico. I would also caution against picking â€œwinnersâ€� in this debate. As an entrepreneur, I have often found that it is precisely when entrenched interests refuse to change that I have had an opportunity to make money by doing things differently. While Iâ€™m a big proponent of nuclear and geothermal energy, these technologies are generally the domain of entrenched interests, and those interests push them very hard. The solar, wind, biomass and energy-efficiency sectors are generally led by entrepreneurs, which is why they have been so successful in the past 10 years, raising more than 150bn in project finance this year alone. SUB-Saharan Africa is weathering the global downturn better than most other parts of the world and is projected to grow by 3,8% and 4,5% this year and next year respectively. The region was positioned for developing solar and hydroelectric energy, as well as the production of biofuels, the report indicated. ABOUT 45,000 residents of Kitgum town now have access to tap water. Individuals and institutions in the town now have tap water connected to their localities at sh59,000... Water is pumped from the wells using electricity, generators and solar power to 230,000 water tanks located at Hill-Top in Kitgum town. Police in Harpy City, the capital of Maryland County, are investigating the breaking and stealing of solar panels that were erected before the Harper City Hall. Police commander Vart Williams said intelligence gathered indicate that the stolen solar panels are in Harper in the hands of some guys not named. FINANCE would not hold back the development of a renewable energy industry in SA but a conducive regulatory environment would. (...) Solaire, the largest privately owned solar power company in France, has a photovoltaic module manufacturing plant in Cape Town. A 10MW solar plant in SA would cost about R300m, Mr Hammond said. THE director of the Namibia Desert Environmental Education Trust (NaDEET), Victoria Keding, has called on environmental centres in the country to be role models in promoting environmental education.... You cannot say people should not cut down trees if you are cooking in the open, she said, adding that NaDEET was involved in a number of environmental protection initiatives, including using solar energy for cooking. FILE | NATION. Kenya's Parliament has taken cue from the electorate following the â€˜Greenâ€™ win in the referendum, and is now asking the Government to enact green policies to protect the environment....MPs also pushed for solar, biogas and wind energy as alternatives to the diesel and petrol engines used in factories and other manufacturing plants. The vice president and minister of Women Affairs, Her Excellency Dr Isatou Njie-Saidy, Monday inaugurated water supply projects in Kuntair in the Jokadu District and Saaba village in Lower Baddibou District, North Bank Region (NBR).... "The provision of solar water listing system combined with safe pipe water distribution.....Cave revealed that the EU involvement in The Gambia's water sector really took off in 1990 with the start of the Western Africa Regional Solar Programme Phase I, and up till date, the water sector is still one of the main sectors of the activities of the EU in The Gambia via the project implemented under the European Development Fund. ....Even in fields where the Chinese seem to have the upper hand, such as solar energy, most of what the Chinese are producing is derivative â€” based on technologies borrowed or stolen from countries such as Germany. It is not for nothing that China is so keen on industrial and economic espionage. The European Union (EU) funded Rural Water Supply Sector Support (RWSSS) projects in the villages of Bonto, Kombo East, Berending, Kombo South and Foni Bintang were last Tuesday handed over to the Ministry of Fisheries, Water Resources and National Assembly Matters.... Minister Bajo further noted that the RWSSS projects, upon completion, will provide over 115, 000 people with potable water through a mix of simple wells equipped with hand pumps, larger solar-powered supplies, and piped systems in some peri-urban areas, which will be connected to the National Water and Electricity Company (NAWEC)....Gomez said it is expected that the 25 solar systems will provide water to over 50, 000 people, and. He revealed that in addition to the solar systems, RWSSS also constructed hand-dug wells and tube wells equipped with hand pumps for small communities, with extensions also made to the Nawec water system to supply communities close to the peri-urban areas. NetOne has intensified its expansion drive in the past two months by installing base stations across the country, the companyâ€™s managing director Mr Reward Kangai has said.... "Most of the new base stations in the rural areas are solar powered. We have strategically positioned the solar powered base stations in areas where there is no nearby national electricity grid. Lâ€™opÃ©ration de rÃ©vision du fichier Ã©lectoral prend fin dans la province du Bas-Congo dans deux semaines. Le but de cette opÃ©ration: permettre Ã la Commission Ã©lectorale indÃ©pendante (CEI) dâ€™Ã©tablir une nouvelle liste dâ€™Ã©lecteurs en prÃ©vision de futures Ã©lections. Plus de 447 centres inscriptions ouverts et 1.910 agents ont Ã©tÃ© mobilisÃ©s Ã cette fin... Le dÃ©ploiement en provinces des kits, des panneaux solaires et des groupes Ã©lectrogÃ¨nes se poursuit normalement, au regard de lâ€™expÃ©rience de la province du Bas-Congo. Un deuxiÃ¨me hÃ©licoptÃ¨re de la Monusco a Ã©tÃ© positionnÃ© Ã Kindu pour accÃ©lÃ©rer le redÃ©ploiement vers les territoires du Maniema. Laurent Gbagbo au colloque de Yamoussoukro : â€œSi je suis Ã©lu prÃ©sident de la RÃ©publique, je vais dÃ©velopper notre armÃ©eâ€�... Quand on parle dâ€™Ã©nergie solaire, lâ€™Afrique devrait rire. Parce que nul nâ€™a le soleil plus que nous. MÃªme quand tu dors la nuit, la chaleur du soleil est encore lÃ . On a le vent pour lâ€™Ã©nergie Ã©olienne. On a tout et pourtant, vous arrivez dans les pays africains, il nâ€™y a dâ€™Ã©lectricitÃ© â€�. Pour Laurent Gbagbo, lâ€™Afrique doit se donner les moyens de son dÃ©veloppement. A biogas cooker. Companies dealing in biogas equipment, energy saving jikos, and light emitting diode (LED) solar lanterns are doing brisk business. â€¦ Mr Mungaiâ€™s is one of the families that are embracing alternative technology in an effort to save on rising firewood, charcoal, kerosene and liquefied petroleum gas (LPG) costs. Growing awareness of the benefits of alternative energy and increased availability of technology that helps generate clean fuel have pushed up demand and created revenue for some firms. Kerosene and LPG prices have increased at the same rate as diesel and petrol prices that have gone up 13 and 10 per cent respectively over the same period due to increased global demand and depreciation of the shilling. As a result, the price of kerosene has increased from an average of $83 per litre in January to $93 by April per barrel. The average price today is about $86 per barrel. Eleven women from the West Africa Network for Peace Building and the Women in Peace Building Network are back in Liberia after completing a one month training workshop in Ghana. The women who were drawn from Margibi, Montserrado, Bong, Nimba and Lofa Counties were trained in kente weaving, basket weaving, making of solar stove, recycling and jewelry at the Kokrobitery Institute. Aphane was briefing Parliament's Portfolio Committee on Energy today, on the public comments received by the department on the Second Integrated Resource Plan (IRP). He said the plan is to promulgate the IRP2 - which will present various scenarios for the country's future energy policy - by November. Leading up to this, the department plans to next month release a draft of the IRP2 for public comment and public hearings would be held with the National Energy Regulator (Nersa). The scenarios would be built using 29 parameters including the effects of climate change, water availability, price elasticity of demand, a carbon tax, distributions infrastructure and renewable energy, on the supply of electricity for the country. The department had received 81 submissions from the public, including from non-governmental organisations, academics and consultants and industry and business, which all made various submissions based on the parameters. Some of these comments were gathered via www.irp2010.co.za while other inputs were gathered from Nedlac. A total of 831 specific inputs have been fed into a database and are now being used to build the various scenarios. Many of the comments were around renewable generation and the IRP2 consultation process itself - with most of the respondents adding that they were impressed with the process itself. Most of the respondents called for a low carbon economy and for renewable energy - such as wind, solar and geothermal - to make up between 20 percent to 75 percent of the country's electricity mix by 2050. Many of the respondents were strongly against coal and nuclear as future energy solutions to the country's future and pointed out the difficulty of obtaining funding for nuclear and coal. They also pointed out the importance for the IRP2 to consider new technologies still emerging, such as solar hydrogen technology and sugar fan fibre as renewable energy source. US-State-Department, 3.8.10. This concept of leapfrogging holds such great promise for Africa. You already have. You didn't have to put up telephone poles, you went right to cell phones in many parts of Africa. Your electric grid doesn't have to be massive. It can be local and regional and provide sources of energy from wind and solar as well as fossil fuels. We stand ready to help in any way we can. African Heads of government, scientists and scholars have been urged to develop and diffuse the excitement and promise of the 21st century in science and technology that could lead to an â€œAfrican Renaissanceâ€�, if the continent's aspiration for self-sustainability is to be achieved in no distant time. Managing Director of the WorldBank Group and Chair, Nelson Mandela Institute (NMI)'s Board of Directors, Dr Ngozi Okonjo- Iweala made the call shortly after the second distinguished lecture series, organised by the NMI in collaboration with the African University of Science and Technology (AUST), at the AUST campus in Abuja recently. The acquisition of knowledge, she said, was not enough. Its utilisation in solving African peoples' problems should be a paramount priority of Africans both at home and in the Diaspora. Okonjo-Iweala delivered the first lecture in the series held last year. Delivering the Second Distinguished Lecture titled, 'New Frontiers in Science and Technology for African Development, Professor of Mechanical and Aerospace Engineering at Princeton University, USA, Oluwole Soboyejo presented some examples of recent collaborations between African and international scientists in the area of science and technology, which were yet to be tapped by successive governments in Africa. Such findings include, possible strategy for African solar cell /LED manufacturing, scaled up pilot plants to manufacture solar cells, early detection of cancer mechanism using therapeutical drugs manufactured from magnetic fields, to mention a few. Soboyejo, thanked NMI and the leadership of AUST, for finding him fit to deliver the lecture and promised to make himself available in the call for self- independence by Africa in science and technology-related fields. Guests at the lecture include, Chief Executive of NMI, Prof. Funmi Arewa; Hamza Isa Baba from the FCT Agency for Science and Technology; Dr Boubou Cisse of the WorldBank and NMI Liaison to AUST; Nwosa Lucky of NOTAP, Resident Surveyor, FCDA, Joe Odoh and a host of AUST leadership, led by the Acting President, Prof. Charles Ejike Chidume. Minister of Science and Technology Prof. Mohammed Ka'Oje Abubakar, has assured Nigerians that renewable energy source will not only compliment oil industry, but boost its usage for future energy generation. The Minister gave this assurance because of fears from some quarters that, in Nigeria, renewable energy, as an alternative source of power supply may pose a threat to the nation's oil industry. Renewable energy is energy that can be replenished through natural process within a relatively short time. This include solar, wind, hydro, biomass, tidal etc. and alternative to fossil fuel. So far this year, the country has received good and almost predictable weather unlike what has happened in the last few years. The long rains came in good time and was well distributed and in good amount. The usual cold season also kicked in on time and it is still with us.... We must not wait for disaster to strike before we act. At the peak of the drought last year, there were some proposals on the table which could go a long way towards mitigating the effects of calamities. These, among others, included the reclaiming of water catchment areas and a requirement that farmers put 10 per cent of their land under trees. Others included using energy saving bulbs, removing eucalyptus from riversides and a requirement that all houses in urban areas be fitted with solar energy collecting systems. This may have given us a false impression that all is well with the climate which may have led to a slowdown of mitigation efforts that had been put in place last year, including reforestation and the search for alternative sources of energy. Lâ€™option sÃ©nÃ©galaise pour les Ã©nergies renouvelables se prÃ©cise. Le prÃ©sident Wade reste en phase avec son option de dÃ©velopper les Ã©nergies de substitution aux sources fossiles comme le pÃ©trole.... Dans cette mÃªme lancÃ©e, il a prÃ©sidÃ© Ã son retour une rÃ©union sur lâ€™Ã©nergie solaire avec une dÃ©lÃ©gation dâ€™ingÃ©nieurs conduite par M. Louis Seck, ministre chargÃ© des Energies renouvelables. (...)Câ€™est ainsi que Digital Links sâ€™est vu confiÃ©e le dÃ©veloppement du Programme National des Green E-Schools au Sierra Leone. 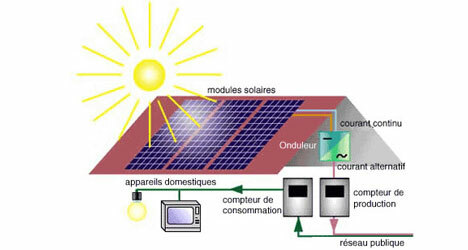 Ce programme, explique-t-elle, Â« consiste Ã installer des salles informatiques avec Ã©nergie solaire dans les Ã©coles publiques de la Sierra Leone Â». Von Desertec, der Initiative zum Bau von groÃŸen Solar- und Windkraftanlagen in Nordafrika hat schon jeder gehÃ¶rt. Den Mittelmeer-Solarplan allerdings kennen nur Eingeweihte. Beide Vorhaben gleichen sich. BITTERFELD-WOLFEN (IT-Times) - Die Q-Cells SE (WKN: 555866) versucht im umkÃ¤mpften internationalen Markt fÃ¼r Solarzellen durch eine aggressive Preispolitik zu bestehen. Andere Wettbewerber suchen ihr Heil verstÃ¤rkt in der Besetzung internationaler MÃ¤rkte. Das ist bei Q-Cells weniger der Fall. Zwar ist man weltweit aktiv, der Hauptabsatz erfolgt jedoch zunehmend in Deutschland.... Seit 2009 gilt eher Nordamerika, insbesondere die USA, als Solar-Wachstumsland. Hier, ebenso wie in Asien und in Afrika, sollten Unternehmen wie Q-Cells prÃ¤sent sein und wachsen, um im internationalen Wettbewerbsmarkt weiterhin zu bestehen. Tokyo / Hamburg, iwr â€“ Der Elektronikkonzern Sharp, Enel Green Power and STMicroelectronics haben fÃ¼r die Produktion von DÃ¼nnschicht-Solarzellen jetzt das Joint Venture-Unternehmen 3Sun S.r.l. gegrÃ¼ndet. Nach Angaben von Sharp soll 3Sun mit der Produktion von DÃ¼nnschicht-Zellen in der zweiten HÃ¤lfte des Jahres 2011 beginnen.... Das Unternehmen wird sich nach Angaben von Sharp als Independent Power Producer (IPP) auf die Entwicklung, den Bau und den Betrieb von PV-Anlagen in Europa, dem Mittleren Osten und Afrika fokussieren.